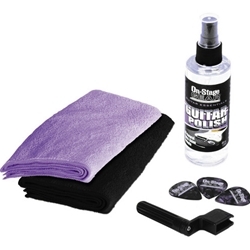 The On-Stage GK7000 Universal Guitar Care Kit includes two microfiber cleaning cloths, a four-ounce bottle of guitar polish, a guitar peg winder, and three celluloid guitar picks. The guitar polish is water-based and has a light citrus scent. The guitar picks come in three thicknesses, 0.46mm, 0.71mm, and 0.96mm.